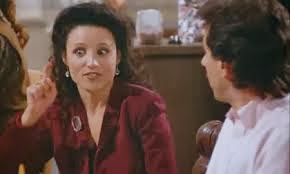 Seinfeld Season 5 Episode 1 "The Mango"
Throughout the ages the concept of faking it has been debated between the genders. Generally, it is accepted that sometimes it may occur, and we are ok with it. Not everything in life is as easy to fake. Well not in a convincing way. Take the man who provided “sign language interpretation” for President Obama’s speech as Nelson Mandela’s memorial. It could be argued that it was the truest form of interpretation – as it was basically a man improvising hand movements with no relationship with what Obama was saying, and no resemblance to any actual sign language signs. Driving a formula one car would be difficult to fake, in race conditions. Though I would like to see one of the pit crew jump on the back of US$7million machine and take over the steering, like an attendant in a dodgem car rink for the one person who inexplicably can not get their car out of the corner. Brain surgery, sure anyone could get a garden drill and bore into the back of someone’s skull. To do it with the precision required so that brain matter does not wind its way back up the drill bit or that the drill bit does not hit the spot that would make the patients leg spasm like a dog getting its belly scratched. Australia’s most recent collection of Prime Ministers have proven that it takes more than merely winning an election to actually lead a country. The programmatic specificity required in the top job proved too much for both Rudd (twice) and Gillard, and if Abbott’s approach to international diplomacy and employment in the car industry are anything to go by things have not changed for the better post the recent election. Ben Elton proved that writing funny and entertaining television is difficult to fake, twice. In 2011 his Australian show Live from Plant Earth survived just 3 episodes. In 2013 his UK sitcom The Wright Way was blasted by critics and viewers alike. Personally I have demonstrated that fine handcrafted wooden furniture is difficult to fake. Even average handmade wooden furniture takes some talent. The aquarium stand I made required the weight of a full fish tank on it to square it up enough for all four legs to touch the ground simultaneously. The surface of the coffee table I made, a glass or mug could only be filled half for risk of spillage the angles were so great. Every generation will lament the next generation of musical artists for faking their musical ability. It is part of the parent handbook to complain to one’s offspring “that’s not music, there is no tune and I can’t understand the lyrics”. In the case of Bob Dylan it is the children complaining to the parents. Earlier this year the zoo in Henan Province, China demonstrated it is difficult to fake animals. A Dog no matter how big and hairy is not a lion, nor a wolf, not even if it is a Tibetan mastiff, and a fox is not a leopard. For that matter a sea cucumber is also not a lizard. Being a fake stunt person could present some challenges. Sure the crashing of the car, jumping from a burning building or participating in a gun fight whilst riding a wild horse through a forest, down a steep incline into a river might be easy to fake. The staying alive whilst doing it is the tricky part.